The sun shines about 350 days a year in the Sonoran Desert. What do you do when the clouds come? You go above the clouds in San Jacinto State Park. Spending a little time in the balmy California desert where Wednesday's high is supposed to be 49 degrees. Global warming my a$$--I could've gotten these temperatures in Ohio. Anyway, here's a a roadside pic of the thousands of windmills along the way from LA to Palm Springs. My question--Why weren't any of them spinning when there were wind advisories for the area? Seems like a good time to get some natural energy. Then again, I have no idea how this whole wind energy thing works. Marine Resource Economics January 2015, Vol. 30, No. 1: 1-20. Marine Resource Economics January 2015, Vol. 30, No. 1: 21-34. 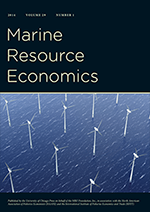 Marine Resource Economics January 2015, Vol. 30, No. 1: 35-49. Marine Resource Economics January 2015, Vol. 30, No. 1: 51-70. Marine Resource Economics January 2015, Vol. 30, No. 1: 71-95. Marine Resource Economics January 2015, Vol. 30, No. 1: 97-119. Marine Resource Economics January 2015, Vol. 30, No. 1: 121-122. Cash is the most efficient gift, according to economists. Cash is also a terrible gift, according to economists. By guaranteeing that the recipient can buy exactly what she wants, you guarantee that the recipient will consider you an unemotional robot. That's why the vast majority of economists in the University of Chicago's IGM poll said it's absurd to give cash to loved ones for the holidays. "In some cases," Steven Kaplan said, in a stirring defense for thoughtful gifts, "non-pecuniary [not cash-related] values are important." The Howard H. Baker Jr. Center for Public Policy (http://bakercenter.utk.edu/) and the Department of Economics (http://econ.bus.utk.edu/) at the University of Tennessee, Knoxville, will host a workshop on Thresholds, Tipping Points, and Random Events in Dynamic Economic Systems on Monday and Tuesday, July 27-28, 2015. The purpose of the workshop is to promote research that uses state of the art techniques and applications whereby discrete events (e.g., thresholds, tipping points, catastrophes) are empirically identified and incorporated into dynamic economic models. Possible examples include, but are not limited to: tipping points in bioeconomic systems, climate change, market entry and exit, technology adoption, species extinction, investment thresholds, disease outbreaks, natural disasters, poverty traps, and informational cascades. Empirical papers with strong theoretical frameworks are especially encouraged, as are papers that combine discrete events in an economic system with discrete events in a physical or natural system. Workshop papers will be considered for publication in the Journal of Economic Behavior & Organization (JEBO) under an expedited review schedule and subject to the Journal’s usual high standards for quality. Accepted papers will be published as part of a special issue tied exclusively to the workshop. The workshop organizers welcome submissions of full papers or long abstracts, though full papers are preferred. Long abstracts should provide evidence that a full paper will be available prior to the workshop. Please email your submission to [email protected] no later than February 15, 2015. Authors of accepted papers will be notified via email by March 31, 2015. Funding for travel, accommodations, and an honorarium will be provided for workshop presenters and discussants. Please watch http://tinyurl.com/ECON2015 for papers and additional information about the workshop as it becomes available. It was difficult to rank the bottom 6 or 7 since most of the year I listened to the top 3 or, especially Lydia Lovelace (I heard her song in Earthfare the other day!). So, I put in the top 7 those that I didn't need to write in at the WNCW poll with write ins for the bottom 3. Sarah Borges was released on December 10, 2013 so it didn't make last year's list. I also bought Wilco (Rare Tracks) and Shelby Lynne (I Am Shelby Lynne, which is a rerelease with a few new songs). Both are great. Here is a link to last year's list. What did I miss (besides Sturgill Simpson)? And just where do all these Macroeconomists think they're going to work? Here is a summary of the fields of the PhD job market candidates at the 'top' econ programs this year. Since most environmental economists are really public economists trained in applied and theoretical micro and econometrics, I'm going to go ahead and group Micro Theory (26), Econometrics (14), Public (12), Applied Micro (11) and Environmental (8) under the Env-Econ umbrella and claim Env-Econ is really the top field (71). Now that Sony has set a precedent of pulling movies after the parent company is hacked, I worry that the Empire will be using the Force on Disney now that the Force is awakening. Russian consumers flocked to the stores Wednesday, frantically buying a range of big-ticket items to pre-empt the price rises kicked off by the staggering fall in the value of the ruble in recent days. As the Russian authorities announced a series of measures to ease the pressure on the ruble, which slid 15 percent in the previous two days and raised fears of a bank run, many Russians were buying cars and home appliances — in some cases in record numbers — before prices for these imported goods shoot higher. The Swedish furniture giant IKEA already warned Russian consumers that its prices will rise Thursday, which resulted in weekend-like crowds at a Moscow store on a Wednesday afternoon. Expectations of higher prices are a self-fulfilling prophesy. If consumers expect prices to rise in the future, demand increases today causing, you guessed it, higher prices.